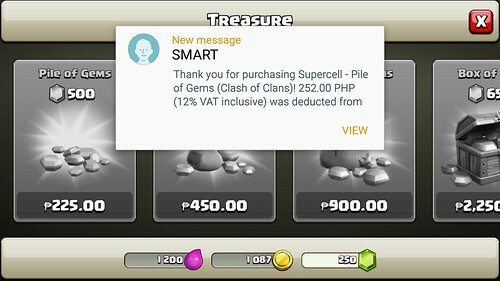 HOW TO GET CLASH OF CLANS GEMS FROM SMART - I Blog, Therefore I Am. 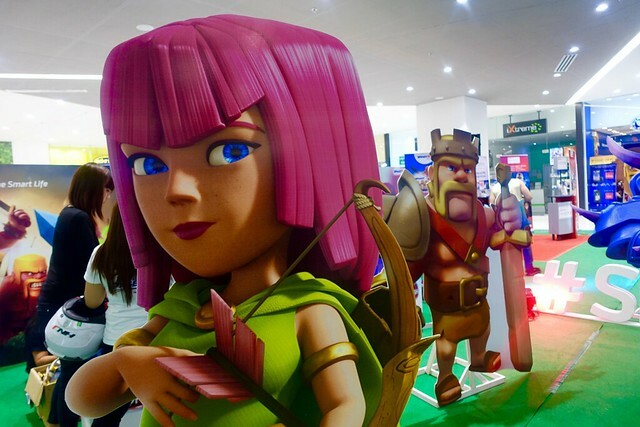 Clash of Clans is probably one of the most competitive and popular mobile games in the world today. Supercell, the developer of Clash of Clans, reportedly earned around $1.7B in 2014 due to in-app purchases and advertisements (it definitely defeated Kim Kardashian's mobile game). The game is very addicting! I tried it last year but stopped. But I re-built my village and continued just a month ago just in time for Smart's Philippine Clash Tournament. As observed - an average 'clasher' usually spend a Pile of Gems (or 500 gems) a week for upgrades and to speed up things. It's priced at $4.99. 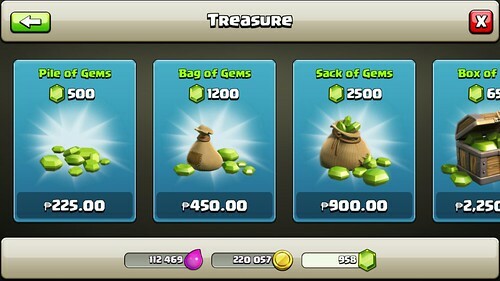 Go to the 'Shop' section of your Clash of Clan village and select Treasure. 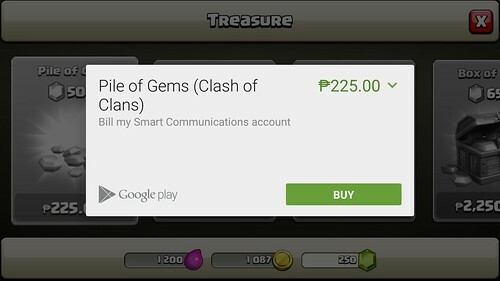 Choose among the available pack of gems that you would like to purchase. You will be redirected to the payment page. Click the amount at the upper right corner to know your payment options. 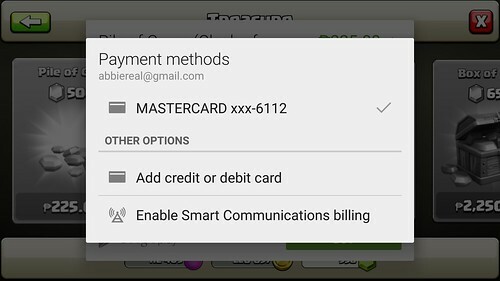 After clicking the amount, Google will ask your preferred mode of payment. Click on Payment Methods and Enable Smart Communications Billing. 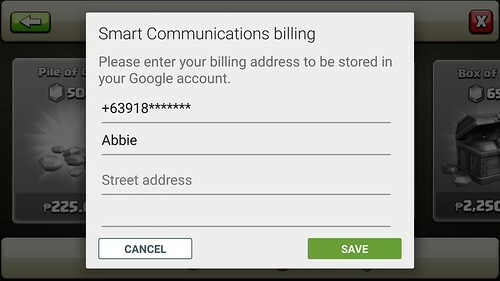 You will be asked to fill-in your number (this is auto-populated with the number of the SIM in your mobile phone), name, and address. Click save after you're done. A confirmation will be sent to you after you fill-in the required information. You can also check and verify this through the Google Wallet site. 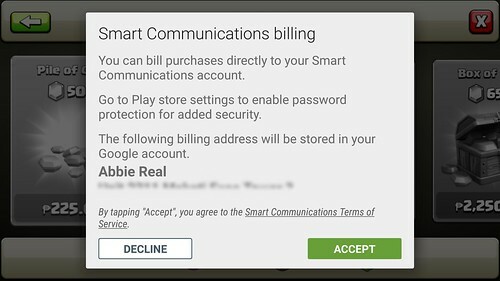 Once you accept - you will be redirected again to the Google Play Store payment page with Smart as the payment method. 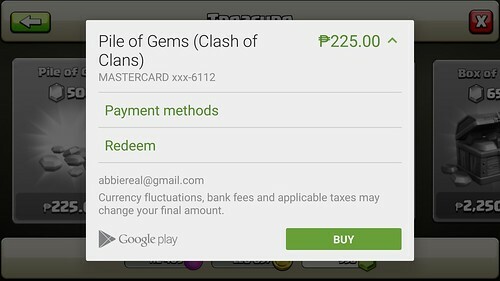 Click buy to purchase your Clash of Clans gems! A notification will be sent to you in-app and via SMS to confirm the purchase. I like this games.. many strategy applied to get win..